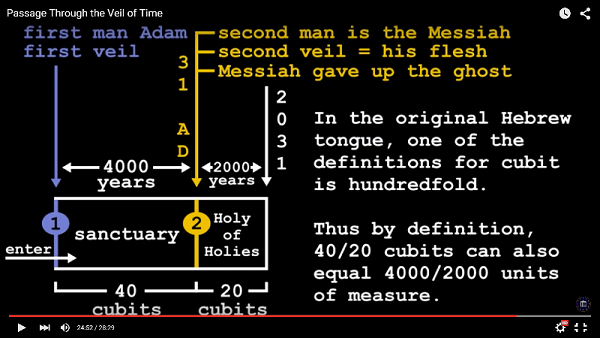 How is history made — songs, dreams, and sermons included? Our topic here is foresight — prediction, prophecy, prognosis, projection. 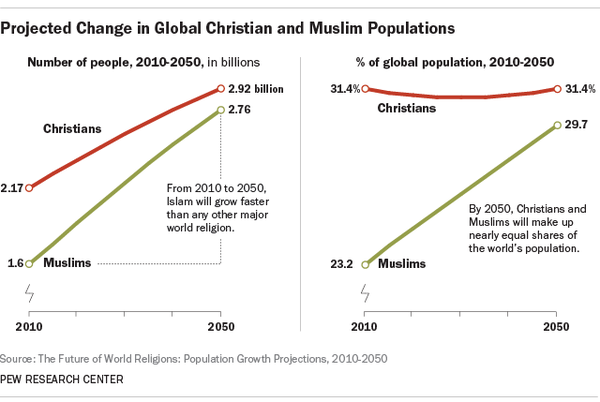 The Legatum Institute today tweeted a Pew Research projection of Muslim and Christian growth 2010-2050. It is now 2015, so for practical purposes, we’re thinking here about prophecies and predictions that offer what their authors hope will come close to 35-year foresight. Short form: I don’t get it. Obama, like him or not, Christ or Antichrist, Peace-Nobelist or Pol, is now US President and has — whatever his strengths, failings, or both — some influence on how the earth turns, which way the moral arc of the universe bends, and or what history will be seen and written once the future is present. Short form: How does history happen? I’ll raise that question by posting three videos along one such arc of history — and I’ll avoid the usual genre of “news” and work with song, dream and sermon. The choice of grace as the unifying theme, which by the standards of political speeches qualifies as a stroke of genius. The shifting registers in which Obama spoke—by which I mean “black” versus “white” modes of speech — and the accompanying deliberate shifts in shadings of the word we. The start-to-end framing of his remarks as religious, and explicitly Christian, and often African American Christian, which allowed him to present political points in an unexpected way. Amazing Grace now takes the place of Strange Fruit, and a President that of a poet and a singer — much has changed, yet much remains. I’m thinking of Lise Meitner as I view the Marine Corps’ ambitiously titled Security Environment Forecast 2030-2045. Who would have thought in 1919 that Hahn, Meitner and Strassmann in 1935 would begin a program that resulted in 1939 in her 1939 paper Disintegration of Uranium by Neutrons: A New Type of Nuclear Reaction — which in turn led to Moe Berg‘s attending a lecture by Heisenberg, the Trinity test at Alamagordo, and Hiroshima and Nagasaki? And yet the period from 1919 (Treaty of Versailles) to 1939 (fission theorized) is only 20 years, and from 1919 to 1945 (nuclear warfare) is 26 years — equivalents, respectively, to the periods from 2015 (today) to 2035 (a third of the way into the USMC’s period of prediction) and 2041 (still within the UMSC timeline). That’s my attempt at a sober assessment of how difficult it is to “see ahead”. My Art of Future Warfare story, War in Heaven, is set — as the contest rules required — in 2090. Forty some years from now, in the wake of John Hardy Elk’s vision and its definitive corroboration “in the external” by physicists at the CERN Diffraction Lab, Shamanism is overturning “the Enlightenment” as the preferred intellectual basis for inquiry. With its gestalt understanding of the interconnectedness not only of space and time but of chance and will, context and perspective, self and other, the Shamanic method of burrowing into deep external space “in the internal” has proven more powerful, faster, and – yes — way more creative than what are now known as the old “heavy lifting” methods of transport. With schools of Tibetan, Navaho, Benedictine and other forms of contemplative instruction now rapidly surpassing CalTech as the educational venues of choice, and Oxford morphing back towards its earlier life in which theology was Queen of the Sciences, a great many talented explorers have now visited realms considered impossibly “far away” even a decade earlier, the “digital” has fallen away at a time when communication between the like-minded is achieved telepathically, and “radiance bombs” vie with “dark bombs” in the end-of-century duels scattered across many galaxies in which “white” and “black” magics compete — under the law, some would say theory, of the Conservation of Moral Balance. Who knows? Who can really say? Historians — on the world-line this is written from, and consequently in those cognate worldlines in which you are reading me — tend to date the by now (2050) clear shift in priorities (if not in actualization) currently emerging along these world-lines to the 2020 joint publication in Nature and Physical Review G of Dogen’s confirmation of the Everett-Klee Transformation Hypothesis, which stated (in its minimal formulation) that free choice is the mechanism by which a human individual switches tracks in a given “present moment” from a “past” world-line to a particular “future” world-line, branching “in that moment” from the first. We don’t, I posited, move across parallel “shadow” worlds by diving into portrait size Tarot cards, walking a kundalini-enhancing maze, or substituting the sky, landscape and other furniture of one world-line into that of another, though the great Roger Zelazny in his Amber series posits these as methods for planet-hopping. My suggestion: we chose which routes we take when faced with the constant bifurcations of the manyworlds by the moral choices we make. Posted in Afghanistan Roundtable, Charles Cameron, christianity, dreams, futurism, history, Islam, MLK, music, obama, prediction, prophecy, racism, science fiction, Uncategorized, USMC | Comments Off on How is history made — songs, dreams, and sermons included? Splitting hairs, atoms, black swans? In view of this comparison, is the MCSEF’s assertion plausible? Analysis of patterns and trends in seven categories, including demographics, technology, resource competition, environmental stresses, globalization, governance, and urban littorals, enables projection 15 to 30 years into the future of four plausible world futures: a baseline future, two alternative futures, and a “preferred” future. — and we haven’t even considered how much influence von Neumann and Turing would have by 1945, as understood in 2019..
— at least according to the video Passage through the Veil of Time. As a sidenote, the USMC Futures Directorate either hasn’t run across this date-setting (likely) or (most improbable) dismisses it as lacking sound reasoning or evidence. Ha! 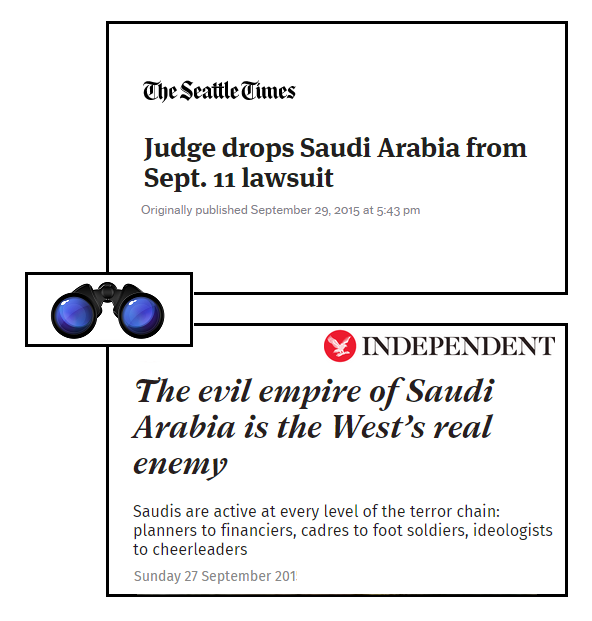 Saudi Arabia — on or off the hook? 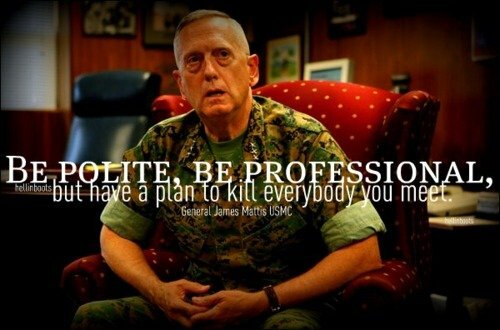 General James N. “Mad Dog ” Mattis, USMC (ret. ), the semi-legendary, no-nonsense, fighting general of our recent wars, beloved by his Marines, has accepted a Distinguished Visiting Fellowship at the highly regarded Hoover Institution, where he has been writing an online column. A fancy way of saying that General Mattis has become a blogger. In fact, he’s quite good at it. We do not enter wars to withdraw; when we must fight, we fight to win. We should not set arbitrary deadlines which would only reveal that our hearts are not really in the game and would unintentionally embolden our enemies with the recognizable goal of outlasting us. We should not establish geographic limits in a fight against a franchising, trans-national terrorist group and its associates. Our AUMF must be fit for the purpose of defeating this specific enemy (a non-state entity) and whoever stands with them, but not be hidebound by the rules for how we fought previous wars against nation states. We must adapt to our time and the threat and not try to fight as we did in the past using rules no longer effective or applicable. The AUMF should put the enemy on notice that we will deploy all our military capabilities, as well as our diplomatic and economic tools. If employing our ground forces will help build the international coalition against ISIS, will hasten the enemy’s defeat, will help to suffocate ISIS’ recruiting through humiliating them on the battlefield, or negatively impact their fundraising cachet, then our Commander-in-Chief should have that option immediately available to achieve our war aims. When fighting a barbaric enemy who strikes fear into the hearts of many, especially those living in close proximity to this foe, we must not reassure that enemy in advance that it will not face the fiercest, most skillful and ethical combat force in the world. The AUMF must also make clear that prisoners taken from forces declared hostile will be held until hostilities cease. There is no earthly reason for the Congress to acquiesce to funding a war in which we do not hold prisoners until the fight is over, as is our legitimate right under international law. The AUMF should make clear that the same standards that applied to prisoners in Lincoln’s or FDR’s day will be imposed today. This will ensure that we have a sustainable detainee policy instead of the self-inflicted legal quandary we face today, with released detainees returning to the battlefield to fight us. “Catch and release” by the Bush and Obama administrations – and the latter tightening ROE in Afghanistan into the gray, blurry zone between military force and law enforcement, was self-defeating and probably is responsible for a sizable number of American casualties. We at ZP would like to thank Colonel Stan Coerr for his permission to reprint this essay, written on the eve of his retirement last July, after a quarter century of of military service in the Marine Corps Reserve and on active duty. Stan Coerr is the author of Rubicon: the Poetry of War and is a retired Colonel in the Marine Corps Reserve and works in the federal civil service. He holds degrees from Duke, Harvard and the Naval War College, has been a fellow at MIT and Stanford, and was recently accepted to begin work on a doctorate at Oxford. He is finishing a book on his time in Iraq, and his next book will be on the life and work of Dr. Bernard Fall. Today is my last day in the uniform of the United States Marines. I write this not as a farewell. Rather, this is a reflection on this tribe of which I am a part, and which is inside me forever. What I remember of twenty- five years inside this brotherhood are vignettes: stories that indicate who we are and why we devote our lives to an organization such as this. Some happened to me; others I read or saw. All describe who we are as Marines. What everyone looking in from the outside must realize is that Marines are instant brothers, no matter the situation, no matter whether they have met before that moment. The Marines are a tribe. We have our own language, culture, mores and idiomatic shorthand communication. We have our own distinctive clothing. We cut our hair in a distinctive way. We paint our bodies with unique tribal markings. We undergo rites of passage to turn boys into men, the men we need to further the greater good of us all. We hand down legends of those who went before, who fell in battle, who did great and heroic things. We sing songs to celebrate them; we memorize what they did. We listen to the wisdom of the tribal elders, and we turn to them for decisions and guidance. Ken Schwenke and Mike Dossett are 180 degrees out from one another in style, but those of us fortunate enough to be Marine Options at NROTC Duke, a team forty strong in the mid to late 1980s, to this day benefit from the nurturing and guidance and demanding perfection of those two men. Bob Dobson was an exceptional battalion commander, a very deep thinker and a man who knew how to train Marines. I was fortunate to work beneath the finest general officers the Marine Corps can produce. I worked for George Trautman when he was both a Lieutenant Colonel and a Lieutenant General, and his relentless, driving intellect and fearsome demand for detail, analysis and good decisions sharpened me in ways I am still discovering. I was lucky enough to serve beneath Generals Mattis, Conway and Dunford, in both peace and war, and from when they were Colonels to their positions as four-star generals. The nation is fortunate that men such as these have set us on the course we follow today. The Marine Corps is people, and it is stories. I am marching a platoon down the streets of New Orleans during the Mardi Gras parades in 1989, as leader of the drill team. I was to the side of the team as they marched, so I was right next to the screaming crowds. Tens of thousands of people lined the streets, screaming and shrieking and cheering. Marine options in college wear navy uniforms but Marine Corps eagle, globe and anchor insignia. Never saw him, never spoke to him. I check in to Bob Dobson’s rifle battalion in Twentynine Palms, California in 1994. Then-Colonel Jim Mattis, the Seventh Marines regimental commander, called for me to come see him. I was not only just a brand-new Captain, but I was an aviator in an infantry regiment: I was not a key player. Colonel Mattis took his phone off the hook, closed his office door and spent over an hour, just with me, telling me his warfighting philosophy, vision, goals and expectations. He told me how he saw us fighting – and where – and how he was getting us ready to do just that. America knows him as the caricature: Mad Dog Mattis. Those of us who served with him know that he is a gifted, caring, warfighting general, and the finest of tribal elders. I am watching a film clip from Vietnam. Jack Laurence of CBS News, a very talented TV reporter and author of the magnificent memoir The Cat From Hue, was out in the jungle with a Marine rifle company. Somehow a Marine from another unit was separated from his brothers, and this company had found him. Laurence rolls tape, and approaches the company commander. This man is wearing filthy utilities. He is exhausted and thirty pounds underweight, with a cigarette hanging from the corner of his mouth. A man with things to do and the weight of hundreds of lives on his shoulders. A hard, intense man. I am with Paddy Gough in a Cobra over 29 Palms in December 1992. We are at one hundred feet, flying back from a mission. It is bitter cold on the desert floor, below freezing, and a dark, ugly cloud layer sits low on the sand. A line of exhausted Marines below us is marching back to their camp after a week of training. They string out like ants, hundreds of them in the cold. They are bent under their equipment: heavy weapons, mortar tubes, ammunition, packs, helmets, flak jackets. I am a seven-year-old boy, and my father is putting me to sleep. I am sleeping in a Marine Corps-issue jungle hammock, which of course to a boy is the coolest thing ever. I need something to read, so he disappears into the study and returns. He hands me a book I read cover to cover and which I am holding right now: the 1962 Guidebook for Marines. I am giving a speech in El Cajon, California in July 2003. I was one of the first people back from the invasion of Iraq, and I was therefore much in demand from local groups who wanted to hear about this campaign in Mesopotamia. I was outdoors at a Fourth of July street festival, speaking to a crowd of several hundred people and telling them how magnificent our fighting force was, and what I had seen. I told these people that their Marines were in the fight in the desert, winning, doing it right for the people back home, representing the best of who we are as a nation. Standing far to the back of the crowd was a motorcycle gang. Huge, hairy guys, dozens of them, in beards and bandannas and wraparound sunglasses and leather and boots, leaning on their Harleys. As I came off the stage, they came to me as a group. The first of them grabbed me and I now saw the EGA sewn onto his vest, right next to his Vietnam campaign patch. Karl Marlantes was in the best position imaginable in 1967. He was on a Rhodes Scholarship, comfortable in Oxford, immune from the Vietnam War and the vagaries of the draft. He was immersed in the world’s premier academic institution on a full ride, the goal of every serious college student. “I couldn’t go to a party without thinking of my Marine friends, terrified in the jungle while I was hanging onto my girlfriend’s warm body with one arm and holding a pint of bitter in the other. The one choice my conscience would not allow was to sit it out in college. “I wanted to find in a commonplace world a chance to live heroically. Having known nothing but security, comfort and peace, I hungered for danger, challenges and violence. The Marine Corps was more than a branch of the armed services. It was a society unto itself, demanding total commitment to its doctrines and values. We were novitiates, and the rigorous training , administered by the high priests called drill instructors, was to be our ordeal of initiation. I earned that right, as did many of you. As did millions before us, and the millions to follow. I feel no sadness about taking off the uniform for the last time. The Marine Corps does not care about me….nor should it. The organization will always be there, and it will always hone and harden the finest our country has to offer. I was only one of many…but at the same time, I was one of the few. The Marine Corps serves the nation, and those of us who are called serve the Marine Corps. Most of all, we serve our brothers.